Visual Studio Code>Other>CppSolutionNew to Visual Studio Code? Get it now. In short: it's not like Visual Studio, in which you don't have to worry about anything above. When you open a file in a vs project, configs like include/defines are prepared automatically so that auto-complete works well, and you can build/debug your target simply by clicking some buttons. Also you can build/rebuild/clean in project view. 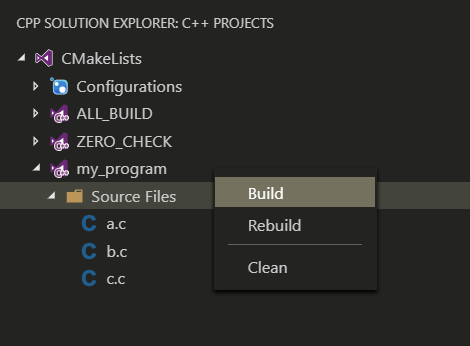 Clion also use cmake as its underlining project engine, it will run cmake -G CodeBlock ... to get a CodeBlock project, inside which we can get everything we want. Cpp Solution Explorer also generate CodeBlock project in *nix systems, but not for Windows. In Windows we generate Visual Studio solutions. Cpp Solution Explorer works on both backend. This is a great extension that makes vscode so powerfull that you can forget about Visual Studio ( actually you can't :-) ) if you are from .Net world.